Masterful Scrapbook Design | when you’ve got a passion for a hobby . . .
. . .you want to go deeper in, refining your skills, learning, talking and thinking about what you love. You need the company and advice of others with the same passion. Interviews and office hours support comprehensive e-books in each class. A new group of teachers takes on challenging assignments in each class — and we share their rich layout annotations with you. 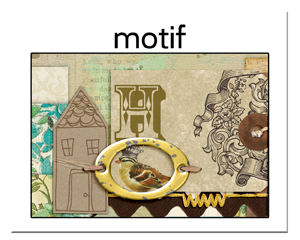 Since September 2010 we’ve been producing Masterful Scrapbook Design, a series of classes that go in-depth on one focus topic with a variety of guest designers. Every class includes a comprehensive e-book with lots of layouts and ideas and instruction as well as video/audio interviews with all of the guest teachers. Here are the details on 34 of those classes — who taught and what we covered. Get all of these classes with a Get It Scrapped membership. Everything is downloadable for you to keep even if your membership expires. 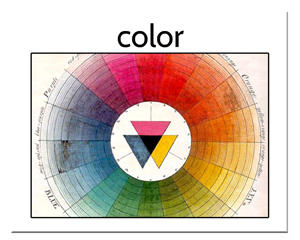 This class goes beyond the basics of color. You know the basics of color – schemes, emotional and cultural associations, mixing in gallon, quart, pint quantities. Now find out how to put that knowledge to work to make pages that pop, set tone, charm, tell your stories. Study with: Kelly Noel, Dina Wakley, Lynn Grieveson, Lisa Dickinson, and Krista Sahlin. Tension gets attention. When you set up a situation with tension, the viewer feels like something isn’t quite right, that something might happen that the viewer doesn’t want to miss. 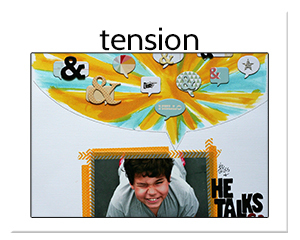 Creating visual tension on your scrapbook pages will give them energy and interest. Study tension with author, teacher and mixed media artist Dina Wakley, digital product designer and scrapbooker Anna Aspnes, Two Peas Garden Girl Corrie Jones, Jenni Bowlin Marketing Director Doris Sander, and Cocoa Daisy Marketing and Design Team Lead Emily Pitts. Includes 300 page e-book, 10 live events during Sept/Oct 2013, and video/audio recordings of each live events. Five teachers with an affinity for grid and blocked designs share the details of why they like grids and the many creative ways they use them. Paper scrapbookers Lisa Dickinson, Doris Sander, and Summer Fullerton along with digital scrapbookers Lynnette Penacho and Tiffany Tillman have ideas and examples to inspire all scrapbookers. -Tiffany Tillman’s 3 techniques for making grids that don’t look like grids (they are the “Tuck and Cover,” the “Twist,” and the “Frame” but you really need her lesson to put them to work). 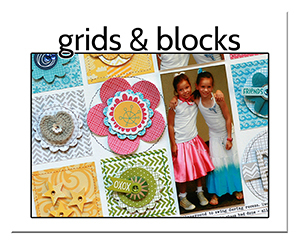 -Lynnette Penacho’s how-tos for Photoshop tools that make working with grids and blocks a snap. 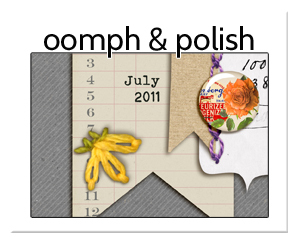 -Ideas for beginning a scrapbook page with a blocked base from Doris Sander, Summer Fullerton and the rest of the team. -Go-to techniques for filling the compartments of a grid and keeping things balanced and flowing. -5 ways for making hybrid-grid designs. -Lisa Dickinson’s 4 favorite ways to loosen up a grid design. -5 sketches and layered templates for Photoshop based on our guest teacher’s designs. 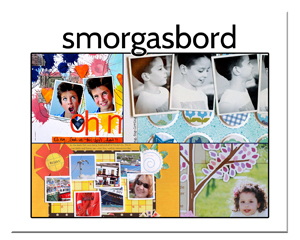 -10 hours of scrapbook talk (in video or audio) to get you inspired and enjoying giving your photos the backdrops that tell their stories well. -Many more lessons and ideas to numerous to mention. You learn to make scrapbook pages that go deeper than the surface details, beginning with journaling and titles that go beyond the obvious in both their content and rendering. Guest teachers Anna Aspnes, Lisa Dickinson, Amanda Jones, Krista Sahlin and Dina Wakley share top product and technique choices, photo treatments, approaches to journaling, layout, titlework and embellishing. Guest teachers Summer Fullerton, Kelly Noel, Lynnette Penacho, Tiffany Tillman. Understand our designers’ go-to compositions, including their approaches to white space, balance, and flow. See, also, how to push favorite designs for new looks. Consider a “photo-to-layout” process and the implications of color, foundations, and inspiration for layout design. Leverage all of this as you use your own favorite compositional approaches to tell your stories with photos and words. Includes 200+page e-book with 50+ annotated layouts and 4 video/audio interviews with guest teachers. 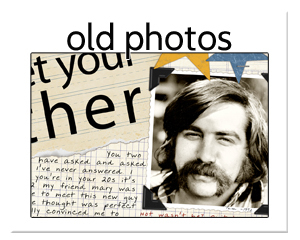 Choose the old photos you want to scrapbook and find the stories to go with them. Revisit your early days and those of your ancestors with story and design angles. Match product and composition to “the times” and find the connections that add meaning to those older photos you’ve waiting to get onto the page. Includes 200+page e-book with 50+ annotated layouts and 4 video/audio interviews with guest teachers. While “fashion” refers to the popular style at a certain place and time, “style” refers to the outward expression of YOUR attitude, personality, preferences and aesthetic tendencies. Style is what makes your creations YOURS. Explore and understand your preferences, masteries, frustrations to create in your own style. If you’re interested in developing a distinctive style, we’ve got 7 activities to get you there. Includes 200+page e-book with 60+ annotated layouts and 5 video/audio interviews with guest teachers. Some trends you love and some leave you scratching your head. 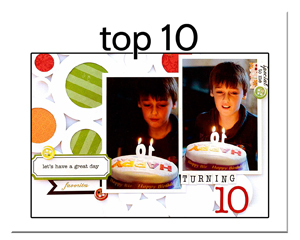 Designers for top digital and paper scrapbooking manufacturers show you their approach to watching and using trends. See how Tiffany Tillman, Kim Watson, Amber Ries, Doris Sander and Corrie Jones stay true to their own style and, at the same, leverage trends for fresh approaches to the page. Includes 200+page e-book with 60+ annotated layouts and 5 video/audio interviews with guest teachers. Forecasting trends and spotting trends are two different things. How to be a trendspotter. Why trends arise at a particular time. 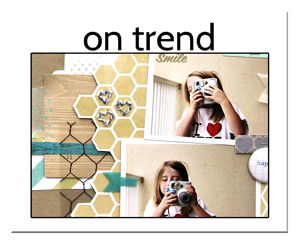 How trends manifest in scrapbooking. Using trendy motifs, patterns, materials, technique, and color. Keeping a timeless look while using trendy elements. Using inspiration to create scrapbook pages is an efficient way to get more pages made and it’s the best tool around for finding and refining your design style. Understand 10 sources of inspiration for scrapbook pages and use 80+ links to websites and curated boards to find the best inspiration for your pages. 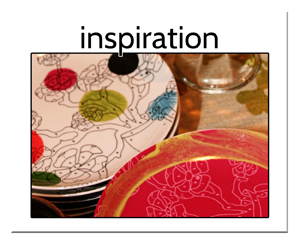 Identify the design elements of your inspiration pieces and use those color, texture, pattern, shape, line, space, and value approaches on your own projects. Apply inspiration to composition, photos, titlework, journaling, subject, motif, and technique. 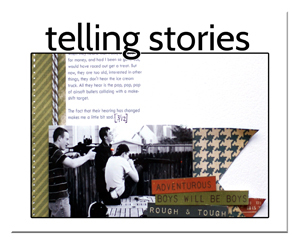 Tell more stories on your scrapbook pages. Tell the old stories and the new ones. Use fiction-writing techniques for scene, dialogue and narrative. This issue includes a 35+ page “seminar” with accompanying video, 7 focus lessons, and 5 video interviews with guest teachers. Art journaling techniques and mixed media supplies are making their way onto scrapbook pages. This seminar will show you the unique looks you can get by making backgrounds with stencils, ink, paint, mist, doodling, embossing and the digital equivalents. Add texture with collage, modeling paste, and lots of techniques as demonstrated by this month’s guest teachers. Use layers to add visual interest, incorporate meaningful images and motifs and reveal your personal style. 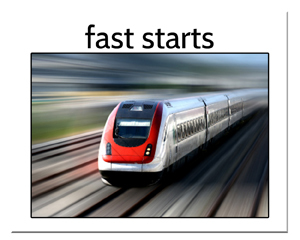 Use text to convey meaning and get visual impact. Work with images from your photos and other sources using a variety of techniques. 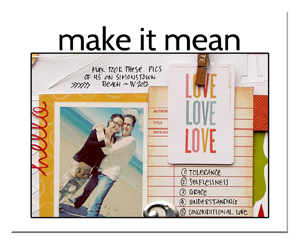 In this issue of Masterful Scrapbook Design we tackle scrapbooking photos that don’t present any specific event or immediately obvious story to record. The teaching team was challenged to make pages with the photos that we frequent shooters accumulate but don’t feel motivated to scrapbook. 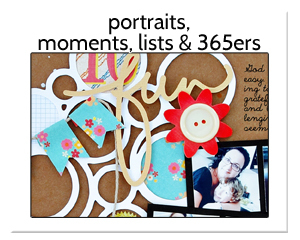 You’ll find approaches to making meaningful (and often fun) scrapbook pages with portraits, one-offs, 365ers of inanimate objects, and more here. 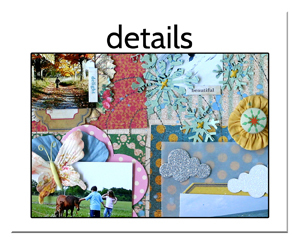 Scrapbook page embellishment is about the joy of the detail.This month we luxuriate in these details that are as delightful to select and place as they are to see on the finished piece later. 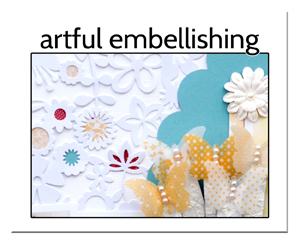 We begin this immersion in embellishing with a look at how embellishments help you tell your story and delight the viewer’s eye. 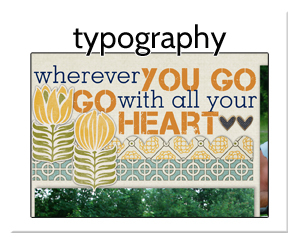 Use type as focal point, embellishment, title, backdrop with ideas and how-tos from paper and digital scrapbookers who rock the typography on their own scrapbook pages. From paisleys to paw prints, you’ll find a huge variety of images on scrapbook papers and embellishments that you can use to support your page subject. Learn about motifs as fun decorations, as cues to your subject, and even as triggers for associations that can be used to deepen meaning. 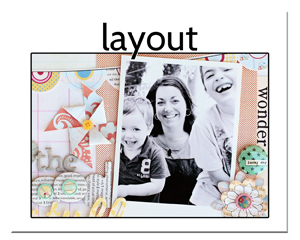 Every scrapbook page should have a primary area of interest (the focal point!) that acts as the point of entry into the layout. 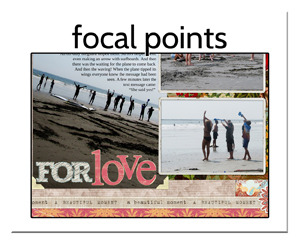 Understand and see why a focal point helps you tell your story and make a well-designed page. Learn how to make a focal point with eye-catching techniques that fall into the categories of Appeal, Contrast, and Structure. 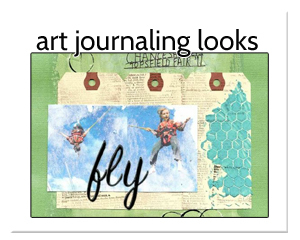 This issue focuses on the scrapbook page canvas, beginning with the options you have for its base, moving onto the first layers and foundations you place upon on it, and delving into the many ways you can fill a canvas for striking looks. 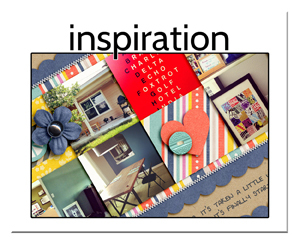 Amy Kingsford: Building a Foundation that Sets the Mood for Your Page. 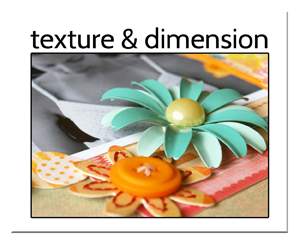 In this issue we are looking at adding texture and dimension to both digital and paper pages in this issue. Texture is a powerful art element because it can quickly evoke memories and emotions. Artists use both visual and physical textures to trigger your memories of previous texture experiences. Texture is tactile: it appeals to our sense of touch. 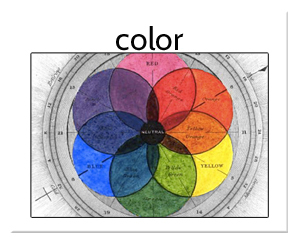 It is an essential design element for visual artists, because it engages another sense in addition to sight. When you can incorporate texture on your pages, you draw your viewer in on another level. 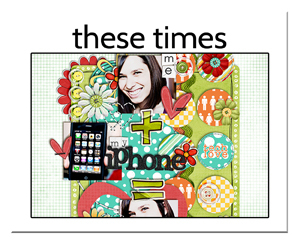 Your comfort level with design principles and elements goes way up this month when you see how digital and paper scrapbookers Emily Pitts, Lisa Dickinson, Vivian Masket, Amy Mallory, and Kayleigh Wiles challenge themselves and end up with striking results. Design principles are a great jumping off point for anyone who want to make original and well-designed pages. Not only do you learn how to work with “variations on a theme” you also get a handle on how attention to every little detail when it comes to design play yields great pages. This special issue of Masterful Scrapbook Design includes 8+ hours of video/audio conversations with 24 top scrapbook page designers. The interviews ask questions and get answers that give you the know-how and inspiration to use current techniques and products as you tell your stories on scrapbook pages. The topics included are: hybrid scrapbooking, finding and evolving your style, composition, digital pages inspired by paper pages, pages with lots on them, favorite techniques for paper pages, clean and simple pages that wow, pages that reflect the times. Whether you’re a speedy scrapbooker or one who puts things together at a slower tempo, there are times when you need to step up the pace up. You’ll get details on how to speed things up in the areas of preparation, streamlining page elements, product choices, and process. And then . 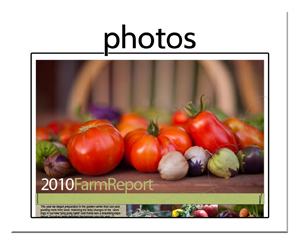 . . you get lots more “by the numbers.” Understand and use basic approaches that work for pages with 1, 2, 3, and 4 photos. Amy Kingsford: Time to Open a Can of Creativity on Those Layouts? It’s the rare scrapbook page that doesn’t feature a photo. We’re talking about the many aspects of taking photos, selecting the ones you’re putting on the page, cropping and editing photos, and all those design choices photos drive. We cover best tips for “getting the shot,” strategies for selecting the “keepers,” approaches to editing and cropping photos, and new ways of thinking about how to place your photos on the page. 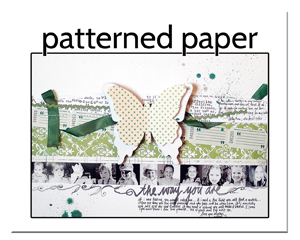 This module is all about using the scrapbook supplies you have in both creative and practical ways. 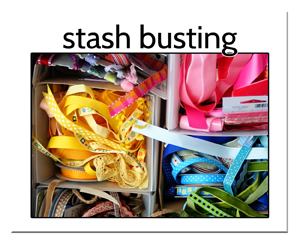 The goal is to help you use your stash, try new things, and make scrapbook pages you love. We’ve got approaches, inspiration, interviews, and lessons that get you thinking about product and scrapbook pages in ways that get your bins, baskets, and digital folders emptier and your albums fuller. Since antiquity, patterns have been incorporated into tiles, linens, rugs, wallpaper, dishes, upholstery, clothing and more. Oscar Wilde said, “The repetitions of patterns give us rest. The marvels of designs stir the imagination.” This month we’re looking at patterns in both big and small ways, learning how to choose, mix, and use them on our scrapbook pages. We’ve heard a lot about “finding inspiration” for your pages from store shelves, magazines, fashion, websites and many other resources. 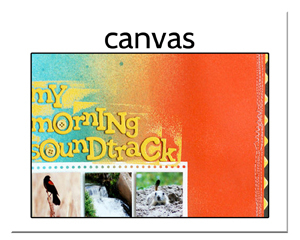 It’s time to get specific about just how we can show YOU resources and methods for finding, gathering, and specifically translating inspiration to the scrapbook page. A good title connects your photos to their story. 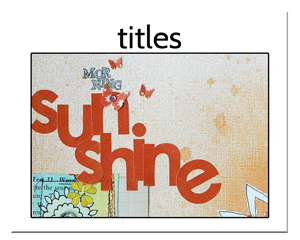 We’re going to talk about the wide variety of approaches you can take for coming up with and designing your scrapbook page titles. From low-key and descriptive titles to elaborate word-plays filling half the page, we’ll give you ideas and help you get quicker and more skilled at designing titles you’ll love. Seminar, annotated layouts, focus lessons and 4 video/audio interviews. Whether you want to get a short record of thoughts and facts down or write a longer recount, we’re sharing ideas, how-tos, and resources that will help you do this well. 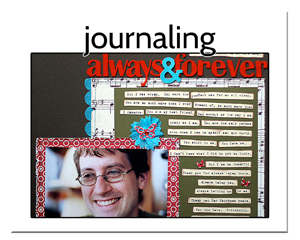 We explore both the composition and content of journaling as well as ways to incorporate it into overall page design. Seminar, annotated layouts, focus lessons and 4 video/audio interviews. Debbie Hodge: Lots of photos–and journaling, too! This is a huge topic and the seminar that goes with it is huge! 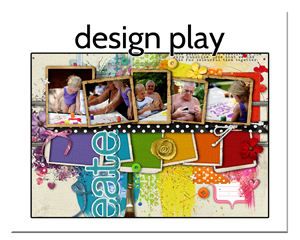 We show you how to approach scrapbooking your events with analysis and creativity. 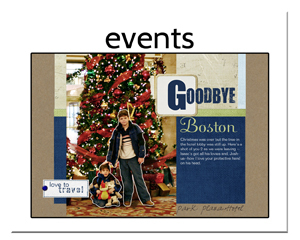 Understand the kinds of events you scrapbook and the many aspects of any event. What’s more use cropping and design techniques to make multi-photo one -and two-page layouts that tell your story well and look great. Webinars, annotated layouts, album projects by each guest designer and 9 videos for getting your photos in order make this a big bundle. Our study of embellishing/using details on scrapbook pages kicks off with a survey course including the role embellishments should plan on a page, specific ways to add charm and design interest as well as strengthen the design of your pages. Four in-depth interviews with guest teachers as well as articles and 100+ annotated layouts make this a treasure trove of ideas and instruction for anyone who want to ramp up their embellishing skills or even just have more fun making awesome pages. 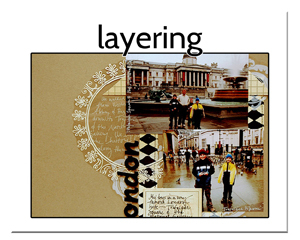 This is an in-depth and rich exploration of “layering-it-on!” We cover reasons to layer–what layers do for a scrapbook page–as well as how to go about layering, including the kinds of materials that are available and the ways in which you can explore and express meaning with your choices. In the interviews you’ll get new ideas and insights from paper and digital scrapbookers — and the interesting thing about this is that the ideas translate wonderfully between mediums. Articles and even a spray-ink video as well as 100+ annotated layouts will provide ideas and inspiration for all. Amber Ries: Takes a layout from blah to ah! Are you ready to truly get a handle on color — on what role it plays in memory keeping, on how it triggers emotional and cultural associations, and on how a smart use of design principles with your understanding of color can help you make awesome pages? Check out the seminar, interviews, challenges and annotated layouts to become more masterful at color.